In The Builders, the cards represent buildings or workers. Players score points (and gain money) by completing the construction of buildings, while placing a worker on a construction site costs money. The goal is to get to 17 victory points by building and assigning workers to those buildings to get points and money. At the start of the game each player receives 10 ecu and an apprentice. five buildings and five workers are placed open on the table. The deck of buildings and that of the workers are set aside for later. Open a Site: take a building out of 5 available and place it in front of you. Draw a new building from the deck so 5 are available again. Recruit a Worker: pick a worker from the row and draw a new one. Assign a Worker to a Building: you have to pay its wages. each building needs resources and each worker gives a small amount of resources. Whenever the buildings needs are met you get the points and coins indicated and flip the building. all assigned workers become available again. Get Money: 1 action 1 money, 2 actions 3 money, 3 actions 6 money. At the end of the game 10 money gives 1 point. There are also some machines in the buildings deck that when completed become workers with resources and points. whenever a player hits 17 points the end is near. all players take one more turn so everybody gets an even amount of turns. all points are counted including points for leftover money. the player with the most points wins. The Builders: Middle Ages, from Asmodee, is a surprisingly fun game in a tiny metal box. It is truly portable, as all of its components are contained in a roughly five inch square, two inch deep tin. The components are square “building” cards, rectangular “worker” cards, and plastic gold and silver colored coins. The game supports two to four players, and it plays quickly with two. Players begin an with “Apprentice” worker card and 10 money units. Gold is worth five, and silver is worth one. The worker cards have clear icons that show the worker’s skill value and his cost to play. The higher a worker’s skill level, the more expensive his labor. But the most skilled workers complete construction phases more quickly. There are four distinct “skills” that each worker may have – stone, wood, tile, and knowledge. They are clearly marked in distinctly colored icons along the side of the worker cards. On a player’s turn, he can take any combination of three actions of his choosing. The actions are take a building card, take a worker card, assign a worker to a building, or take coins from the bank. Structures require a certain number of skill “credits” to construct and complete. Completed structures yield victory points, and more currency for future projects. The first player to 17 victory points wins. The structure cards are designed so that the skill points required to complete them align with those on the worker cards. Simple structures may yield 1 victory point and five to six coins, while more complex buildings can produce eight victory points and 20 coins. Most structures require the employment of more than worker. But once a structure is complete, players return the workers to their hand. As the game progresses, players have an increased number of workers at their disposal, so they can complete specific buildings more efficiently. The Builders: Middle Ages has some similarities to Splendor, which is among my current favorites. The card drafting, set collecting, tableau building mechanic will be familiar to those who have played games like Splendor. A player must use his actions efficiently in order to be the first to 17 victory points. Most of the games I have played have been close, so maximizing every turn is essential. At less than $15, The Builders: Middle Ages is a super value. It is deep enough to keep players thinking, but light enough to play at a relaxed pace. And it can be stashed in the smallest of places for travel. I found The Builders: The Middle Ages near the front of my FLGS, near boxes of several different iterations of Fluxx and different Timeline tins. On impulse, I purchased it—remembering a friend saying it was “sort of like Splendor.” Some people may be put off by the game coming in a tin box, but don’t let that deter you. This 2-4 people game has plenty of depth to keep you thinking, but is light enough to keep gameplay relaxed. Players score points by completing buildings, and they must pay money to place workers and machines on construction sites. Each of the building cards has four requirements: wood, stone, tile, and knowledge, and each requirement has a level between 0 and 5. The workers have the same stats and the same levels. To complete the construction of a building, you must add enough workers and machines to cover the characteristics required on the building card. You start the game with ten money units and an apprentice card. Five buildings and five workers are placed face up on the table, and the others are set aside in their respective decks. On your turn, you can take three free actions. Any extra actions will cost you some cash. Your actions include Selecting a Site (picking one of the five available buildings), Recruiting a Worker (picking one of the five available workers), Assigning a Worker to a Building (paying the cost of the worker and placing him on the building. When the building’s requirements are met, you earn points and coins and get to flip the card over to show the completed building. The workers then get to return to your labor pool), and Getting Money (you can skip one, two, or all three actions and earn 1, 3, or six money units). Some of the buildings you can complete include machines that can be used to complete future buildings. These machines have their own stats that contribute toward a building’s need for wood, stone, tile, and knowledge, and they can be VERY handy down the line. Play continues until one player reaches 17 points, then all players finish their round so everyone has the same number of turns. When tallying points, each completed building has a point value, and each ten money units adds one additional point. The player with the most points is, of course, the winner. 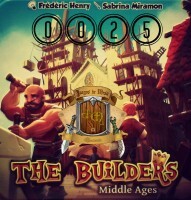 The Builders: The Middle Ages is a very fun, very engaging little game. It’s true that fans of Splendor will be familiar with the basic mechanics of the game, but the rules are simple enough for anyone to pick up. It’s portable enough and has a small enough footprint that my wife and I played it at a mall food court. A terrific bargain at around $15! Add a Review for "The Builders: Middle Ages"